THOMPSON, JAMES, soldier and office holder; b. 1733 in Tain, Scotland, son of James Thompson; d. 25 Aug. 1830 at Quebec. James Thompson probably came from a Jacobite family subjected to repression by the English after the battle of Culloden in 1746. He must have studied civil engineering, since he later put his knowledge in that field at the service of the British army. Like many young men from war-impoverished Scotland who were attracted by the promise of land grants, he enlisted in 1757 in the 78th Foot, known as Fraser’s Highlanders, which had been raised to fight in North America. He chose the company commanded by his cousin, Captain Charles Baillie, who made him a sergeant and promised him an officer’s commission in the event of an opening. Baillie’s death the following year put an end to his chances of promotion. 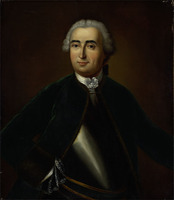 In 1758 Thompson participated with his regiment in the siege of Louisbourg, Île Royale (Cape Breton Island), during which he learned how to make fascines. He took part in the capture of Quebec in 1759, and in the surrender of Montreal the following year. In the autumn of 1760 he was quartered at Saint-Pierre-de-la-Rivière-du-Sud and became friends with the family of Michel Blais*, a prominent farmer. Returning to Quebec for the winter, he was temporarily assigned to the military engineering service and was in charge of 200 soldiers building fascines near the Rivière Saint-Charles. When the war ended in 1763, the 78th Foot was demobilized. Thompson remained at Quebec, as a clerk of works with the engineering corps. He was under the orders of Captain John Marr until 1772, but he does not seem to have had steady employment. In July 1770 Marr noted that Thompson had been paid only sporadically since March 1769 and it had been necessary to stop projects after the commander-in-chief refused to approve a pay-roll signed by Thompson. 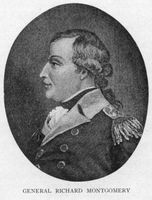 Thompson had married, probably shortly after the war, but his wife and their six children died before the American invasion in 1775–76. 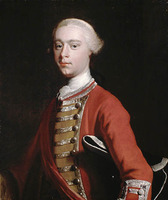 When Marr went to Scotland on leave in 1772, the military authorities decided to put Thompson, a civilian, at the head of the military engineering service, rather than appoint an infantry or artillery officer, the usual practice when there was no officer available from the Royal Engineers. Promoted overseer of works at double his former salary, Thompson carried out his duties for three and a half years with no assistant. He supervised repairs to military and government buildings and fortifications, made up payrolls, prepared estimates, bought construction materials, and negotiated contracts. His engineering office at Quebec being the only one for the whole colony, in 1773, for example, he dealt with the contract to build supply depots for the troops at Trois-Rivières. When the Americans invaded, Thompson was responsible for readying the fortifications of Quebec for a siege. He put up stockades where the fortifications were not high and barricades at the edges of Lower Town and at the top of the rise leading to Upper Town. After the enemy’s unsuccessful attack during the night of 30–31 Dec. 1775, Thompson saw to the burial in the Saint-Louis bastion of Richard Montgomery*, the American general killed in the fighting, and kept his sword as a souvenir. 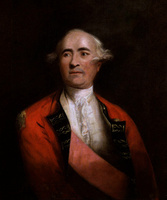 In June 1776, when reinforcements arrived, Thompson was confirmed in his duties by William Twiss, the officer of the Royal Engineers who took command of the military engineering service. The state of war led to a multiplication of defensive works. In addition to supervising the personnel at Quebec, Thompson carried out special missions in the countryside. In 1780 he went to La Malbaie, which was on Major John Nairne*’s seigneury, to organize the construction of barracks for American prisoners. Then he negotiated contracts for putting up military buildings in Saint-Thomas parish (at Montmagny), where German troops were quartered. After the war, in 1784, Thompson investigated a claim by James Cuthbert*, the seigneur of Berthier, for £10,000 for damages caused by the British army. He proved it was unjustified. The commander-in-chief, Frederick Haldimand*, was satisfied with Thompson’s services and recommended to his successors that he be retained in his post despite the cuts that came with the return of peace. Thompson was worried, however, since in 1785 he had to ask the Board of Ordnance to confirm his appointment. He noted his activities in his diary in order to be able to justify his job and in the end he was successful. On 6 Dec. 1780 Thompson married Frances (Fanny) Cooper in the Anglican church at Quebec. They had nine children, three of whom died in infancy. All but the eldest were baptized in St Andrew’s Presbyterian Church. The family lived in the former episcopal palace, where the military engineers had offices, until 1788. Having received a living allowance that year, Thompson took up residence on Rue Saint-Louis, and then on Rue Sainte-Angèle. He bought a lot at the corner of Rue Sainte-Ursule and Ruette des Ursulines in 1791 and had a house built in 1793; his descendants would live there until 1957. Thompson, however, considered his income insufficient. In 1799 he asked for and obtained a 50 per cent increase in salary in consideration of his long service record and his large family. He had hoped for careers as engineering officers for his sons. Through Edward* Augustus, Duke of Kent and Strathearn, he made efforts to have them admitted to the Royal Military Academy in Woolwich (London). But candidates had to be between 14 and 16 years of age, and his three eldest sons had passed the maximum age before his plans could be carried out. 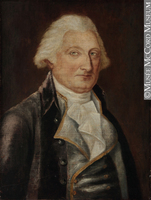 Only the youngest, George, was admitted, in 1804, thanks to the support of Robert Mathews*, Haldimand’s former military secretary, and Colonel Twiss. He became an officer in the Royal Regiment of Artillery in 1808, while James and William Alexander went into the commissariat service and John Gawler became a lawyer and later a judge. One of Thompson’s daughters married a merchant and the other a schoolteacher. Thompson belonged to the middle class. In addition to his house, from 1795 he owned a property in Armagh Township, a land grant that he had applied for jointly with Michel Blais as early as 1767. He earned £174 a year, a sum including the living allowance, a daily food allowance, and a supply of firewood, which was the equivalent of an army lieutenant’s income. In 1821 his house was in a dangerous state of disrepair, and in recognition of his years of work the engineering service repaired it for him. Despite his advanced age, Thompson carried out his duties as overseer of works until 1825. He was then granted a pension equal to his full salary. In 1828 he asked for and received £188 a year. Towards the end of his life Thompson became celebrated for his wealth of memories. 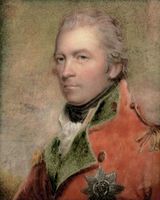 Upon arriving at Quebec in 1818, the new governor, the Duke of Richmond [Lennox*], sent for him to ask about James Wolfe*, the siege of Quebec, and Fraser’s Highlanders. Later Thompson was invited on several occasions to the home of Governor Lord Dalhousie [Ramsay*]. In 1828, as the last survivor of the battle on the Plains of Abraham and as deputy grand master of the freemasons, he had the honour of helping lay the foundation-stone of the monument to Wolfe and Montcalm* in the garden of the Château Saint-Louis. That year he dictated reminiscences and anecdotes from the two sieges of Quebec and that of Louisbourg to one of his sons. James Thompson died in 1830, aged 97. The Quebec Mercury described him as an intrepid soldier, a faithful servant of the king, the father of a large and respectable family, and a practising Presbyterian. A Scottish immigrant who had lived at Quebec for 70 years, he had taken part in the capture of the town in 1759, its defence in 1775–76, and the construction of works such as the Hope and Prescott gates and the citadel. His memoirs and diary bear witness to his time. ANQ-Q, CE1-61, 6 déc. 1780; CE1-66, 10 avril 1784, 5 juill. 1789, 5 févr. 1792, 22 juill. 1793, 18 avril 1797, 17 juin 1798, 27 août 1830; CN1-284, 22 sept. 1791; P-254. BL, Add .Mss 21885: ff.203–5, 266–73, 276. PAC, MG 24, A12, sect.3, nos.366, 422 (transcripts); vol.16, 1828; vol.17, 31 July 1828; RG 1, L3L: 139, 144, 168, 184, 283, 1758, 21884, 91519–58; RG 8,I (C ser. ), 223: 131–32, 135; 1208: 246. PRO, CO 42/192: 137; WO 55/1224: 186; 55/1820: 30–32. Québec, Ministère des Affaires culturelles, direction régionale de Québec, Dossiers hist. semi-actifs, maison Thompson-Côté. “Les dénombrements de Québec” (Plessis), ANQ Rapport, 1948–49: 17, 119, 169. James Thompson, “The journal of Sergeant James Thompson, 1758–1830,” Literary and Hist. Soc. of Quebec, Trans. (Quebec), new ser., 22 (1892–98): 53–56. Quebec Mercury, 28 Aug. 1830. “Les Presbytériens à Québec en 1802,” BRH, 42: 728. Quebec almanac, 1792–1801. Quebec directory, 1790–91. J. R. Harper, The Fraser Highlanders (Montreal, 1979). “À propos de Montgomery,” BRH, 42 (1936): 85–86. “L’épée du général Montgomery,” BRH, 20 (1914): 162; BRH, 33 (1927): 529–30. “L’honorable John-Gawler Thompson,” BRH, 32 (1926): 125. “An interesting reminiscence,” Quebec Gazette, 19 March 1862: 2. “Les jumeaux Thompson,” BRH, 44 (1938): 356. J. M. LeMoine, “Les sièges de 1759 et 1775,” BRH, 1 (1895): 157. Gérard Morin, “Trésors historiques accumulés par une famille écossaise de notre ville remis aux autorités,” Le Soleil (Québec), 9 juin 1950: 3, 13. “Portrait de James Thompson,” BRH, 61 (1955): 185. J.-E. Roy, “Armagh,” BRH, 1: 125. P.-G. Roy, “Les amours du sergent James Thompson,” BRH, 42: 573–76. “Wolfe est-il bien mort sur les plaines d’Abraham,” BRH, 45 (1939): 91–92. Christian Rioux, “THOMPSON, JAMES,” in Dictionary of Canadian Biography, vol. 6, University of Toronto/Université Laval, 2003–, accessed April 24, 2019, http://www.biographi.ca/en/bio/thompson_james_6E.html.